Some of the most useful and effective mobile apps you can build are for field-service workers, people who work on the go outside of traditional offices. Field-service employees work for utilities, engineering companies, in healthcare, property maintenance, and beyond. When they’re out in the field they’re often out of touch with the office, and use paper to track their work, fill out forms, and more. 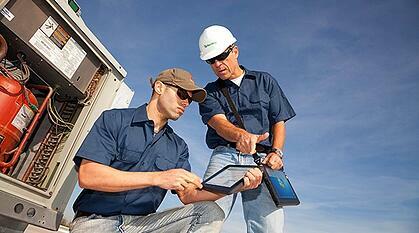 Here are some tips for developing field service apps. With mobile apps, they can always stay in touch. And with mobile-optimized forms, they can do their work on tablets or smartphones, saving a tremendous amount of time, and improving their efficiency and workflow. But they can only do that if the mobile apps they use are well-designed and useful. Sean Johnson, Principal of Field Data Integrators, offers some great advice on how to build better field service mobile apps in his blog post, How to Avoid the Top 3 ‘Gotchas’ of Mobile App Development. Here’s gotcha number two: “Getting locked into a proprietary solution that stakeholders – such as IT – don’t like.” Increasingly, apps can be written outside the purview of IT. But Johnson says IT should always be consulted, because the app could be incompatible with devices IT will be purchasing. In addition, “IT can also help surface proprietary issues and data architecture approaches that can make it difficult to extract or integrate data into key internal systems and processes in the future.” So, he says, make IT part of the process. His final gotcha: “You’ve painted yourself into a corner by not preparing for change.” That means you shouldn’t lock yourself into proprietary solutions. And you should also choose a development tool that lets operational groups make changes to the apps themselves.